Take Route 13 South to the first traffic light in Virginia which will be approx 4 miles past the Maryland- Virginia line. This is T's corner. Turn left at the traffic light onto Rte. 175 / Chincoteague Road. go 1 1/2 miles and Ray's Shanty will be located on your left. There is additional parking on the adjacent corner, follow the signs. Take Route 13 North to T's corner in Oak Hall VA. Turn Right onto Rte. 175 / Chincoteague Road. Go 1 1/2 miles and Ray's Shanty will be located on your left. There is additional parking on the adjacent corner, follow the signs. Leaving Chincoteague Island take the causeway ( Chincoteague Road) approx 9 miles and we are located on the right. Take Rte. 113 to Rte. 12. Go south on Rte. 12 into Virginia where it becomes Rte. 679 / Fleming Road. Continue straight on Rte 679 approx 7 1/2 miles until it intersects with Rte 175 / Chincoteague Rd. 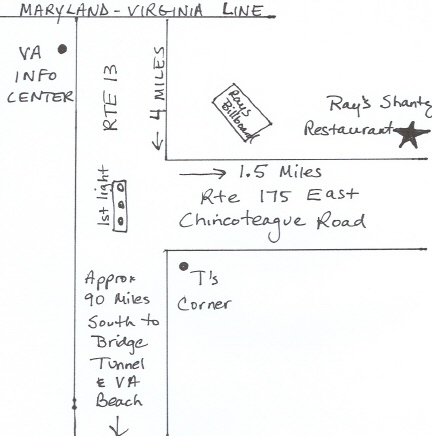 Turn right on Chincoteague Rd and go 1 mile, the restaurant will be on your right.